We are proud to announce that we'll be holding open practice on dates (yet to be determined) throughout the season. Bikes, quads and minis are *ALL* welcome to attend EVERY event at our facility. We would like to thank everyone for an awesome 2018 season and are looking forward to 2019!! You are what makes the sport!! MotoMasters continues to welcome ALL riders from ALL districts and will continue to host USMX races. MotoMasters will continue to race all QUAD classes. Overnight parking is available for racers. Gates will be open at 3 p.m. on the day before races for admission. Gates close at 11p.m. 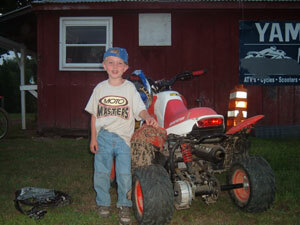 Admission is $10.00 for all racers and $10.00 for spectators ages 10 and up. Under 10 years old are free. Signup is between 6-8 p.m. the evening prior to the race and 7-9 a.m. the morning of the races. Practice begins at 8:30 a.m. sharp. So get there early. Please remember, no glass containers are allowed at MotoMasters. Help to keep our track clean, don't litter. Dogs are to remain leashed in the pit area. Dogs aren't allowed in any spectator area; so if possible please leave your dog at home. No dogs allowed into the track after 9am race day. Sat JULY 20th MXC Race!!! 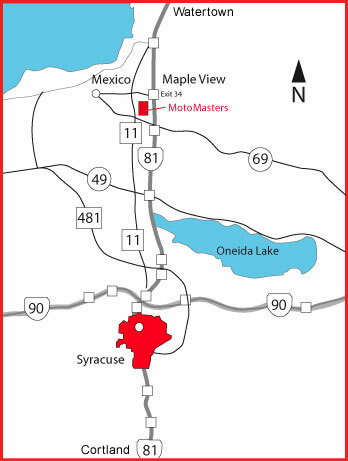 Take Route 81 South to Exit 34 (Mexico, Route 104), turn Right. Go about 1 1/4 mile to the Stop light. Turn Left, head South on Route 11 about 1/4 mile. Track is on the Left. Take Route 104 East, past the Town of Mexico about 5 miles. At the light of Route 104 and Route 11 turn Right, go about 1/4 mile. Track is on the Left. Take Route 69 to Parish and then take Route 81 North to the next exit (#34). Turn Left off exit. Go 1 1/4 mile and turn Left at the light. Head South 1/4 mile. Track is on the Left.